Shareholder Yield: The Case for the Next Decade - Epoch Investment Partners, Inc. Global Equity Shareholder Yield has proven to be a successful strategy since its launch in December 2005, attracting institutional and retail clients worldwide. But that period included economic and financial events that were extraordinary by any measure. Today, capital markets appear to be on the verge of a new epoch (small “e”) as the crises of the last ten years slip further into the past. As William Faulkner said, however, “The past is never dead. It’s not even past.” Most prognostications about our financial future combine “normalization” from recent history (e.g., interest rates, sector valuations) with the more lasting effects of a decade of crises (e.g., secular stagnation). With widespread expectations that the next ten years will be different, it is fair to ask: was this strategy simply right for the time? Or is it, as we believe, a core strategy, relevant for all times? Why has the Shareholder Yield strategy resonated so convincingly with so many investors? We believe there are several attributes at work. First, the strategy is simple, straightforward and based on sound principles: invest in a diversified portfolio of high-quality companies that have a track record of generating growing levels of free cash flow while simultaneously rewarding shareholders with a progressive dividend, supplemented by share repurchases and/or debt reduction. 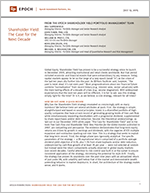 Second, the theoretical underpinnings, as laid out in our December 2005 white paper “The Case for Shareholder Yield” and in the book Free Cash Flow and Shareholder Yield: New Priorities for the Global Investor published in 2007, are compelling and persuasive. The evidence demonstrates that long-term equity returns are driven by growth in earnings and dividends, with the vagaries of P/E multiple expansion and contraction washing out over time. This is a strategy that seeks to exploit that long-term record. Third, the design phase was rigorously analytical. The specific parameters of the strategy — a 9% aspirational return comprised of a portfolio average dividend yield objective of 4.5%, plus 1.5% from share buybacks and/or debt reduction, underpinned by cash-flow growth of at least 3% per year — were not selected at random but instead were the return components actually observed in global equity markets over recent decades. Careful attention to risk control was built in at the outset to ensure consistent application of the strategy, minimizing the potential for style drift. Finally, the strategy has proven its soundness over the past nine years with an annualized return of just under 9%, with volatility well below that of the market and demonstrable wealth protecting behavior in market downturns. In short, the architecture of the strategy makes sense, and it works. Today, we sometimes hear commentary suggesting that market dynamics have changed and the strategy may no longer be appropriate. This commentary falls in three categories. First, interest rates appear to be entering a rising trend after many years of being abnormally low around the world. When rates return to “normal,” the argument goes, yield-oriented equity strategies will suffer as investors gravitate back to bonds. Second, sectors that tend to be emphasized in the strategy such as utilities, consumer staples, and telecom are often characterized today as “overvalued.” As the world returns to growth and risk appetites return, rotation away from these sectors will present a stiff headwind. Third, some have noted that the strategy has recently exhibited higher correlation with the market (“beta”) than has historically been the case, and this diminishes the appeal of GESY as a “core” defensive strategy. We thought it would be useful to examine these claims as a way to better illustrate the strategy. There is no doubt that some investors have sought income from equities while the income available from bonds has diminished. And depending on their goals and needs, they will return to bonds once they again offer competitive yields. The key attraction of a dividend, of course, is that it is not a fixed coupon. Equities offer an income advantage relative to fixed-income securities so long as cash flows are growing. And one would expect to see greater cash-flow growth if rates are rising because of an economic recovery. A more important distinction is that many income seeking investors have gravitated toward stocks on the basis of high absolute levels of yield, including many REITs, MLPs, and utilities. Stocks with the highest dividends, however, are often the result of high payout ratios, leaving little capital to invest for growth. Shareholder Yield is not simply a high-dividend strategy. It is a strategy that invests in companies with attractive and growing dividends, along with share buybacks and debt reduction, all underpinned by growing cash flow. Some of that cash flow we would expect to be invested to ensure ongoing growth as part of a thoughtful capital allocation process. These are companies that will likely continue to grow cash flow and continue to reward shareholders when interest rates start to rise. To label them “bond proxies” fails to appreciate the difference between dividend yield and shareholder yield. The dissimilarity between the two is not only fundamental, but also reflected in returns. Looking back to the beginning of 2003 (the earliest available S&P 500 data in FactSet), the top quartile of stocks in terms dividend payments lagged the top quartile of stocks based on a combination of dividends, share buybacks and debt repayments by an average of 2.8% per year1. We should not interpret this as a proxy for the portfolio because the strategy also looks for growth in free cash flow and makes a judgment on the sustainability of those payments. But the point is that dividend yield and shareholder yield are truly distinct. To use the utilities sector as an example, an examination of the strategy’s holdings reveals that its exposure to the sector is quite different than that of the market in general, represented by the benchmark. To begin with, many of the highest yielding stocks in the sector are absent from the portfolio. This is the result of our stock-by-stock process that is focused more on the sustainability and growth of dividends than a high absolute level of dividend yield. Stocks with the highest yields could reflect companies under stress or payout ratios that are unsustainable. Of the top-ten utilities with the highest yields in the MSCI World Index, the portfolio currently holds only two: Electricite de France and SSE. Another important point is that, by design, the portfolio is highly diversified. This is a core tenet of the strategy. Areas that are perceived to have a headwind from rising interest rates (e.g., utilities) are offset by areas that are perceived to be helped by them (e.g., financials). Of course, these perceptions are vast overgeneralizations, but the main takeaway is that the portfolio is diversified in terms of sectors and macroeconomic exposures. A final thought on the bond proxy discussion is to look at stocks in terms of “duration.” We know that as rates rise, the prices of longer-duration instruments fall faster than the prices of shorter-duration instruments (assuming all else being equal). While the concept of duration is thought to be primarily applicable to fixed-income assets, equities also have this characteristic. Just like bonds, the more cash paid sooner, the lower the duration. A stock that provides shareholder yield is in effect a “shorter-duration” equity than a “growth stock” that has a very low or no dividend payout. Generally speaking, the prices of stocks that pay shareholder yield should be less vulnerable to rising interest rates. Of course, all else is not equal. Some of the demand for high-yielding stocks has come as a result of diminished bond yields, and that demand will lessen as bond yields rise. But the shorter-duration characteristics of stocks with shareholder yield should help offset that when looking at returns relative to other types of stocks. Some investors have concerns that the strategy is invested in defensive sectors that appear “overvalued” relative to their history and to the overall market, and these sectors will come under pressure as investors shift toward more cyclical stocks. Again, we would emphasize that broad-brush characterizations of sector valuation fail to appreciate differences at the company level. The Shareholder Yield strategy looks at valuation through the lens of cash flow and evaluates companies based on their ability to continue to grow cash flow and to continue to reward shareholders with attractive, growing dividends (supplemented at least from time to time with share repurchases and / or debt reduction). It is a foundational principle at Epoch that focusing on cash flow is more powerful and reliable than traditional valuation metrics like P/E or price-to-book. In addition, by targeting a portfolio average cash dividend yield of 4.5%, the strategy has a built-in valuation discipline. The portfolio management team is continually identifying portfolio stocks whose dividend yields have been compressed by price appreciation, selling them and reinvesting in stocks with dividend yields that are more constructive in helping to achieve the overall portfolio yield objective. It is perhaps ironic that a strategy specifically founded on the principle that dividends and earnings are the long-term drivers of stock market returns is called into question at the same time that investors view the market as over-valued by the traditional metric of P/E multiples and worry whether further multiple expansion is possible. If rising P/E multiples in recent years are largely the result of lower interest rates, then a rising interest rate environment implies falling P/Es and is, in fact, a powerful argument in favor of Shareholder Yield (see our May 2014 white paper “The Power of Zero and the Power of the Word”). Valuations will rise and fall. That has been true for the equity market, where nearly 90 years of data show the expansion and contraction of valuations have largely canceled each other out. The same can be expected for sectors within the market. For example, the U.S. utilities sector as a whole was priced at a premium to the S&P 500 Index last year. This year it is again priced at a discount. Some capital appreciation strategies may seek to exploit those variations. The Shareholder Yield strategy does not. It is instead focused on stability of returns. And the goal of achieving at least half of the strategy’s return target in the form of cash dividends is, in our view, a stabilizing factor. Finally, as to the observation that the portfolio beta has been creeping up over the past year or so, we believe this is simply an artifact of declining volatility in equity markets around the world, thanks to global quantitative easing. Specifically, a portfolio’s beta can be expressed as the correlation to a benchmark index multiplied by the ratio of portfolio volatility to index volatility. It turns out, our analysis shows, that the GESY strategy volatility has gone down and remains below that of the index, but that index volatility has declined more. The way the math works, with virtually no change in correlation, this has caused beta to increase. We believe this unusual condition will persist as long as central banks continue their QE programs, and that a return to “normal” monetary policy will see the Global Equity Shareholder Yield strategy volatility rising more slowly than market volatility, thus returning beta to its historical average. Source: FactSet Research Systems; MSCI Inc.; Epoch Investment Partners, Inc. This reinforces the notion that, if we stick to our process with the goal of providing more stable results, the market should move around the strategy rather than the strategy moving around the market. A similar statement can be made for relative returns. The goal of the strategy is to achieve an absolute return of 9% annualized over time. For those focused on relative returns, that will appear attractive when the market is struggling and insufficient when the market is racing ahead. But our hope is that long-term investors seeking a core component to their equity exposure will value the attractive level of absolute return and the relatively stable nature of that return that we expect the strategy to provide. We find ourselves in a world with diminished prospects for economic growth. It is true that developed economies are on the whole experiencing an economic recovery, but it is an anemic one. Government debt has risen substantially since the financial crisis and is acting as a drag on economies. Ultimately, growth in real GDP depends on growth in the workforce and growth in productivity; neither appears promising. And emerging markets are not going to save us this time, as many had hoped. A marked slowdown in China is acting as a counterweight to recoveries in the developed world. There is much debate about the causes and cures regarding this economic malaise. Some characterize it as secular stagnation, a term coined during the Great Depression to reflect low growth, low interest rates and low inflation stemming from a chronic lack of demand. The recommended prescription is fiscal stimulus directed at areas in need of investment, such as infrastructure. But that seems unlikely to occur in either the politically gridlocked U.S. or austerity-minded Europe. Others believe it is due to global imbalances that were the true root cause of the Global Financial Crisis. The belief is that we can return to previous levels of growth after a period of deleveraging. But while we have witnessed substantial debt reduction among consumers and financial companies, in truth the debt has merely shifted to the government sector, as noted earlier. Either way, our economic and business cycles are expected to have lower peaks for a long period of time. So while we are in the midst of a recovery, it remains in the context of a slow-growth world. As we look at companies across markets, that is having an influence on their capital allocation decisions. In a low growth environment, there are fewer opportunities to reinvest that will meet required return thresholds, even with the generally low cost of capital. M&A activity will likely increase, but companies with established businesses that generate free cash and have a disciplined capital allocation process will also be giving more back to shareholders. The Shareholder Yield strategy provides a way to capture those returns. It invests in high-quality companies that not only generate growing free cash, but have a long history of making payments to shareholders a priority. We believe collecting these payments up front, with the intention of making them compose the bulk of your investment return, will provide a measure of reliability and reduced volatility within an equity allocation. That is enhanced by the diversification and risk management embedded in the strategy; no single security is relied on to achieve its goals. (The maximum holding size is 2.5% and no security is allowed to contribute more than 3% of the portfolio’s 4.5% dividend yield target.) With low-volatility characteristics and its focus on an attractive absolute return rather than beating a benchmark, we think the strategy makes sense as a core holding rather than a tactical allocation. Given the long-term economic and financial trends we have outlined, we believe the strategy provides a relevant and compelling approach to equity investing for the coming decade. Long-term trends among S&P 500 companies show steady, multi-year increases in dividends per share, the number of companies paying dividends, the number of companies increasing dividends per share, the volume of share buybacks, and the number of companies repurchasing shares. Both charts indicate a cyclical component with dips occurring around recessions — which is intuitive since free cash flow can be expected to contract during recessions. It is also noteworthy that the Shareholder Yield strategy, launched at the end of 2005, successfully weathered the cyclical downturn in payouts over 2007-2008. 1Calculated using S&P 500 data from FactSet. The quartiles are rebalanced monthly. The dividend, share buyback and debt reduction components are based on a 12-month look back. Hence the most recent data point is 6/30/14. “U.S. companies on course to return $1 tn to shareholders in 2015,” Financial Times, April 12, 2015. “Don’t Give Up on Dividend Strategies,” Wolfe Research, May 11, 2015.